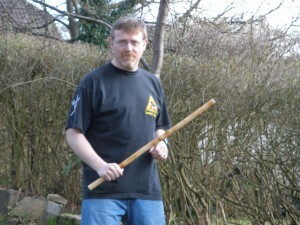 I started training in the Martial Arts in 1992. Firstly, training in Jeet Kune Do and Insonato Kali for 11 years attaining Black belt level in JKD and Red belt status in kali. In 2003 I started training with the Combative Alliance group in Glasgow who were at the time associated with the Dog Brothers Martial Arts. Through this connection I was introduced to the DBMA system and attained Group Leader status running the Glasgow Clan for several years. I have fought at a number of Dog Brothers Gatherings in Europe, starting with the first European Open Gathering in 2006 and have been privileged to be welcomed into the tribe as a full member. Over the years I have dabbled in a number of different arts and I am currently training in BJJ and Bukti Negara Silat to continue my journey in the Martial Arts.